Typical homogenization time is 30 seconds for a large majority of samples. Nucleic acid or proteins are separated from the tissue matrix, and pipetted after a short centrifugation step to pellet the debris. Adapt protocols and consumables from soft to hard tissues (micro-organisms, animal or vegetal tissues). Highest speed motion of the market, it allows the grinding of challenging tissues like bones, hair, cartilague, skin etc. During motion, mechanical impacts between beads and sample can generate heat. Most often, the homogenization process is so rapid that the temperature does not reach denaturation levels. Nevertheless, for sensitive molecules, it is important to master this generation of heat. The Cryolys is a cooling option for the Precellys®24-Dual. Cold air (-50°C) is sprayed beside the tubes so that temperature during homogenization remains at approximately 4°C. 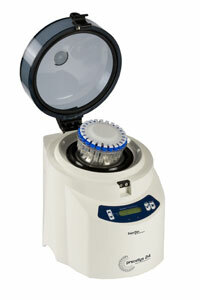 Precellys 24-Dual has been designed for biological sample preparation. Biological space is entirely separated from the mechanical parts preventing any inside contamination. Also individual sealed tubes prevents cross contamination between sample preparations. When the protocol is set up and validated, the sample preparation process remains the same with no bias in analysis, on a time basis, or between operators. it was specifically developed and designed to be used in L3 laboratory under high throughput conditions, 50 to 100 runs per day.